Ed.note: This article is taken from the latest issue of the New Internationalist Magazine. The most important benefit of the equality effect may be that it leads us to behave in ways that are less environmentally damaging. The evidence for this is only emerging now. We can track the effect across a range of indicators by looking at the 25 richest countries in the world, which have varying levels of inequality. The measure of inequality used here is the ratio between the incomes of the best-off 10 per cent of households and those of the worst-off 10 per cent. Bear in mind that this comparison is different from that on Page 14, which compared the income of the top one per cent with the average income. Bear in mind also that the figures for the very rich are probably an underestimate because so much of their income and wealth is hidden, especially in the most unequal countries. All the same, it is clear that some rich countries are substantially more unequal than others, ranging from the most unequal – the US – to the most equal – Denmark. So what is the environmental effect of living in a country in which households are economically unequal as compared to living in one in which the economic differences are far smaller? The book from which this magazine theme is drawn is able to track the effect in detail across 11 different indicators but there is only space here to touch briefly on four: waste; meat consumption; CO2 emissions; and transport. Almost all of what you buy ends up in the bin. We can only store a finite amount of possessions in our homes for any great length of time. When you buy an item, you don’t think about junking it. But you will eventually throw away almost everything you buy. Some of it you may recycle, but recycling is not only never fully efficient, it also uses a great deal of energy and hence generates pollution itself. Not buying things you don’t need is far better, but in a world where the main function of advertising is to get you to buy things that you could live without, that is hard. 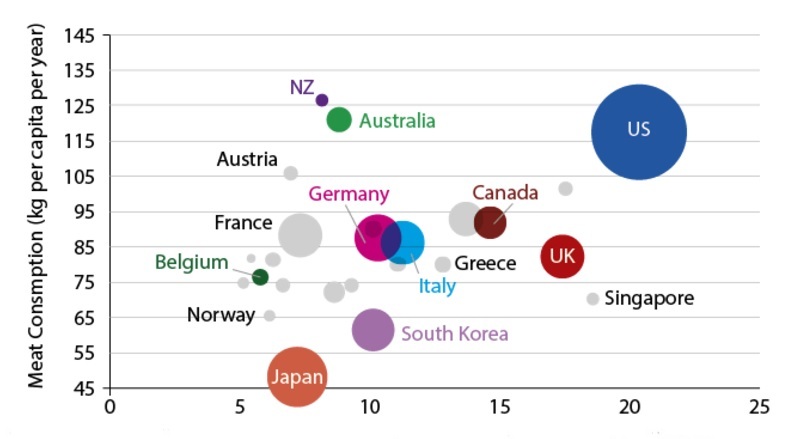 The bubble chart below, in which each country is sized according to its population, tracks an environmental indicator (the vertical axis) against levels of inequality (the horizontal one). Countries to the right are more unequal, while countries that are high up produce more waste. If the correlation between the two were perfect, they would all line up along a line drawn from the bottom left to the top right. 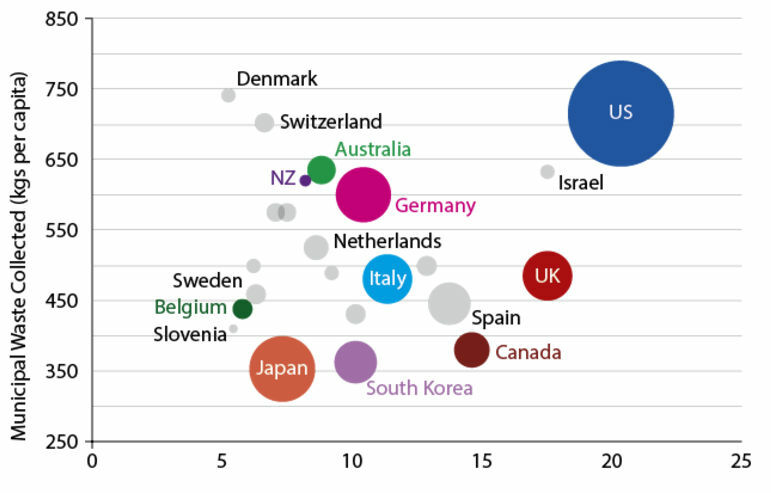 Inevitably there are outliers that don’t fit – in this case Denmark and Switzerland, and this could be because they do a better job of collecting data on waste than other countries. In economically unequal countries the pressure to buy items to keep up with your peers, with ‘people who count’, is enormous, especially when it comes to clothes, fashion, new cars and other status symbols. We are encouraged to be aspirational, to better ourselves, not for the greater good, but for selfish reasons – ultimately, to be able to get all that stuff. A good job is no longer one which benefits society, but one that pays you well. In general, the more economically unequal a rich country is, the more CO2 it emits. There are exceptions of course: the UK is a relatively low emitter because it currently has access to natural gas from the North Sea and has already mined and burned its most accessible coal; 75 per cent of France’s electricity production meanwhile derives from nuclear power, which emits less CO2 but creates much longer-lasting radioactive waste. In contrast, Australia mines and burns a great deal more coal (and also, incidentally, mines a large amount of uranium). In 2015 Oxfam reported in detail on why emissions from some countries were so much greater than others. Collaborating with economists including Thomas Piketty, Oxfam discovered that what drove excessive consumption in any particular affluent country was economic inequality. This is because the best-off in a country tend to waste more energy, heat their homes more than they need to, drive more than they need to in bigger gas-guzzling cars, take more flights and require more cement and other materials to construct their larger-than-needed buildings, while at the same time buying and throwing away more items. In short, if you are very rich, money is no object and you want to be seen spending your riches. In a more equitable country people are, in general, more careful, public transport is better, and the need to keep up with those above you and mimic their behaviour is far less acutely felt. Eating a lot of meat is good neither for you nor the planet. The amount of crops that have to be grown and transported to feed the animals that we eat is far greater than the amount that would be needed if we just ate the crops themselves. So, the more meat per person that is eaten in a country, the less environmentally friendly the people of that country collectively are. By weight (if we ignore insects and fish) most of the animal life on our planet is now intensively farmed for our own consumption. Those animals produce enormous amounts of greenhouse gases during their short lives, with cattle being the worst polluters of all. The most common bird on the planet is now the domestic chicken, reared solely because so many of us in the rich world have become so used to eating cheap meat. The bubble chart below suggests that the more unequal countries (again sized according to population) tend to consume more meat. Again, there are a few outliers – notably Australia and New Zealand/Aotearoa, possibly because their cultural histories are bound up with the rearing of sheep and cattle and their high levels of meat production. But the general trend is pretty clear. Our great-grandparents did not eat much meat at all, and chicken was often for Christmas Day and the occasional Sunday. Increasing meat consumption has not made us healthier. In some countries we are now eating so excessively that it is making many of us obese. Obesity rates are much higher in affluent countries that are more economically unequal. One theory as to why is that the poor in such countries have to resort to cheap fast food, which is advertised to them aggressively and often includes lower-grade meat. Another theory is that in more equitable countries the population tends to be better educated and so can more easily see through the folly of fast-food advertising and gluttony. These theories remain unproven, but what we do know is that people in more economically unequal countries in general eat more meat per person by weight. Whatever the reason, greater equality is associated with less obesity and less meat eating, and the world needs human beings to eat less meat if we are to avoid depleting our soils, increasing greenhouse gases and also reducing the biodiversity of the planet to such an extent that monocultures prevail and we lose habitats. Our excessive use of motor vehicles contributes not only CO2 but also other damaging gases such as carbon monoxide and nitrogen oxides as well as pumping particulate matter into the air we all breathe. Among the most affluent 25 countries three stand out as extreme in this regard: the US, Canada and Australia. These three are among the least densely populated countries in the rich world and driving distances between homes and workplaces are often long, but they have chosen to arrange their cities in this way. That choice was again affected by economic inequality and the beliefs associated with it: that individual aspirations should trump the collective good and that ‘the car is king’. Relatively low petrol/gasoline use in the UK, Singapore and Israel shows that very unequal countries need not necessarily use huge amounts. In these three cases there are large dense urban areas that can only function with good public transport such as underground trains, buses and trams. But it is worth noting that no relatively equal affluent country consumes more than half as much gasoline per person as Canada and the US do each year. All of us will have to consume far less fossil fuel in the near future and those reductions will be far more easily achieved in a country that sees the provision of efficient, low-polluting public transport as a collective good rather than a dangerous precedent. The equality effect on the environment is most evident when we look within countries. In its December 2015 report, Oxfam found that the greatest polluters of all were the most affluent 10 per cent of US households. 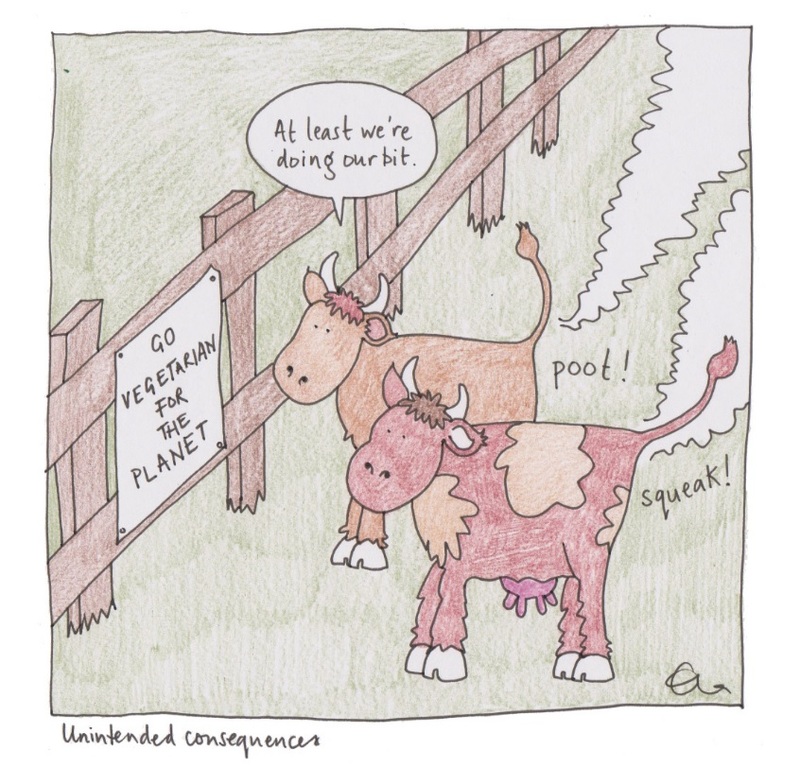 Each emitted, on average, 50 tonnes of CO2 per household member per year. 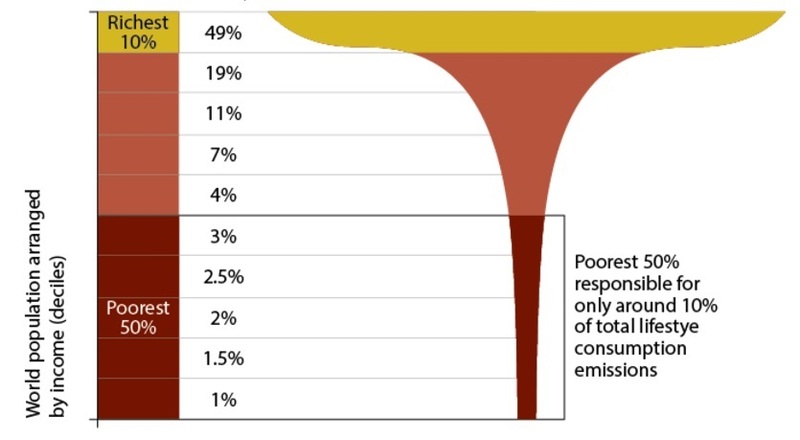 The Canadian top 10 per cent were the next most polluting, followed by the British, Russian and South African elites, as shown in the graph to the right. 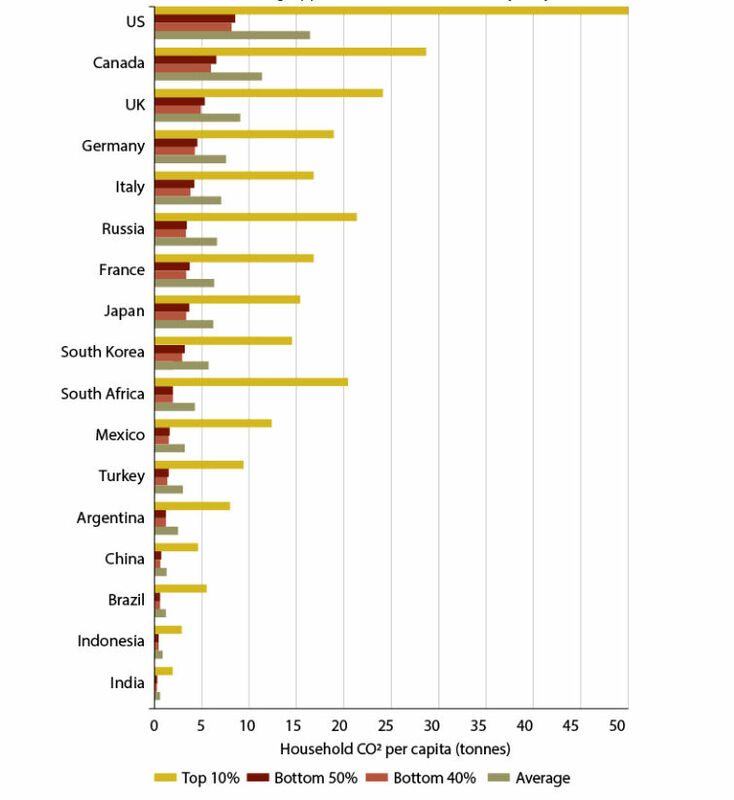 In more equitable affluent countries such as South Korea, Japan, France, Italy and Germany, the rich don’t just pollute less, but average pollution is lower because the bottom half of the population in those societies also pollute less (despite being better off) than the bottom half of the population in the US, Canada or Britain. The equality effect is clearly also an environmental effect. The poor pollute less when less poor and the rich pollute less when less rich. Alternatively we could consider something as simple as the proportion of people who cycle or walk to work in each country. This ranges from 50 per cent (in the Netherlands) to less than 5 per cent (in the US). Everything is connected. People are fatter in the US because they eat more food; because they sit in cars more often and for longer; because they are exposed to more advertising and eat more and buy more cars as a result; because they live in greater fear of crime and so are afraid of not driving; and because they are surrounded by other obese people and therefore don’t feel so unusual if they are also fat. But behind all of these factors lies the basic difference in how human beings are ranked. Ranking really matters to people. Rank them sky high by paying them many times more than other people and they can become so conceited that they more easily treat others who are less well-off poorly, with no respect and with little empathy. When pay differentials are less and no-one’s income is out-of-this world, people realize that they have far more in common with others. They then argue for cycle routes, pavements, good public transport, and to be able to afford to live near where they work. The equality effect influences almost everything we do and so much about us. In 1443 Shinto priests who lived on the edge of Lake Suwa in Japan began recording the date when the lake froze over in winter and when the temperature changes created a ridge of ice across the surface. They believed that the ridge was formed by the feet of the gods as they walked over the lake and so they carried on recording the date the ridge was formed each year after that, to the present day. In the first 250 years of the priests’ recordings the lake only failed to freeze over three times. Between 1955 and 2004 it failed to freeze over 12 times. Between 2005 and 2014 it failed to freeze over five times, every other year. Since 2014 it has not frozen over. There are many different records of global warming, but the Lake Suwa records are the longest and most striking. It has only been since the late 1970s that the 25 rich countries that have been the focus of this article have begun to diverge widely to arrive now at very different levels of economic inequality. Because they have done so, a set of natural experiments has been set up which today allows research into the effects of these differences. The preliminary conclusion based on these natural experiments is that the more economically equitable countries tend to perform better across a wide range of environmental measures. 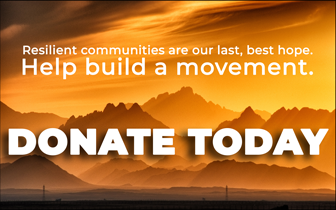 Once we know what the driving forces are, and become fully aware of the damage that is done by inequality in environmental as well as social terms, we will know how necessary it is to embrace change. Danny Dorling is Halford Mackinder professor of human geography at Oxford University.